Craps is a hazard game played with the help of two dice. It includes wagering and the result of the roll or few series of rolls defines the winner. Players are allowed to make stakes and gamble against each other (this variation of craps is known as street craps) or a bank (in this case it is casino craps). 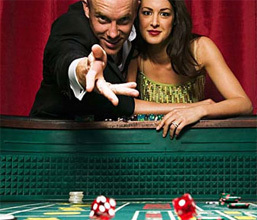 Craps is extremely popular in land-based and online casinos. This game has its own fans in various countries of the world and continues to excite them from one gambling session to another. There are a lot of disputes around craps and its emergence in the land casino history and the exact moment when it has emerged. According to widespread point of view the ancestor of modern craps was an old English adventure called "hazard". This game was similarly played with 2 dice. First records about it may be found in Canterbury Tales written by English poet Geoffrey Chaucer in the 14th century. Some people consider that "hazard" originated from an Arabic "Al Zar" game and migrated to Europe even earlier than 12th century. It could also come from Egypt where (according to some sources) dice games were popular and played a vital part in the lifestyle of ancient society. The origin of craps is really very difficult to define but it may date back to crusades with their knights and religious military campaigns. The game "hazard" migrated to Europe and started to gain wide popularity among gamblers. In the 17th century every English tavern hosted gamblers that were fond of this particular game. Game travelled across the English Chanel and reached France where the game was renamed to "craps." It enslaved the hearts of gamblers and spread across various gambling establishments. With settlers from Great Britain/France craps reached America. There is a notion that craps was brought to New Orleans by French gambler and politician named Bernard Xavier Philippe. Thus, the game began to popularize and develop and resulted in modern variations of craps as we know it today. In the 19th century John H. Winn developed the game by adding some features to the land casinos standards: for instance, he introduced "pass" and "don't pass" betting option. He made the game simpler and invented up-to-date layout to the game. Moreover it is considered that he invented the rules of this game and pushed the game to the pick of its popularity. Nowadays craps in widely played in land-based and online casinos. Thanks to the development of the internet technologies it was even more popularized and became available for far-reaching regions. Share their excitement and join the best online casinos. Welcome!